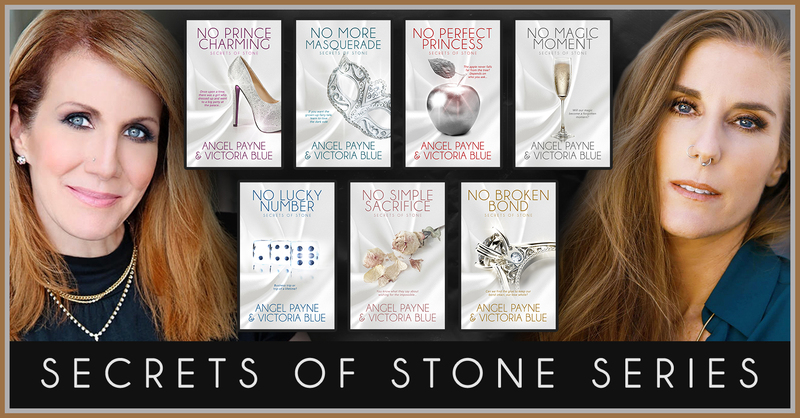 DESTIN FL December 1, 2017 — Waterhouse Press has announced the acquisition of the Secrets of Stone Series, co-authored by Victoria Blue and USA Today bestselling author Angel Payne. The first seven titles in the series will re-release in December 2017, with the final three debuting in 2018. Payne and Blue have been co-writing romance for five years. “Collaborating with Angel has been a once-in-a-lifetime adventure. We feed off one another’s creativity. I can’t imagine taking this journey with anyone else,” Blue remarks. No Prince Charming is the series starter, introducing readers to the world of PR guru Claire Montgomery and Killian Stone, the tycoon whose dirty laundry she’s been hired to make go away. Payne is the author of the Honor Bound Series, as well as Misadventures of a Super Hero, and its forthcoming “super” spinoff serial, the Bolt Saga. Misadventures with a Time Traveler, originally slated for a spring 2018 release, has been rescheduled to release as a full-length trilogy in summer 2019. The newly imagined time traveler series will follow the journey of romance and discovery between a cursed French prince, Max De Leon, and his reluctant soulmate and curse-breaker, fast-talking New York fashion blogger Allie Fine. Waterhouse Press first published Meredith Wild and has since expanded to help introduce other talented authors to the rapidly growing demographic of romance readers. Waterhouse stands apart as a publisher that not only appreciates a strong and memorable story, but one that focuses on creating powerful, lasting brands for each of its authors. Additional information about Waterhouse authors can be found at www.waterhousepress.com/#ourAuthors.